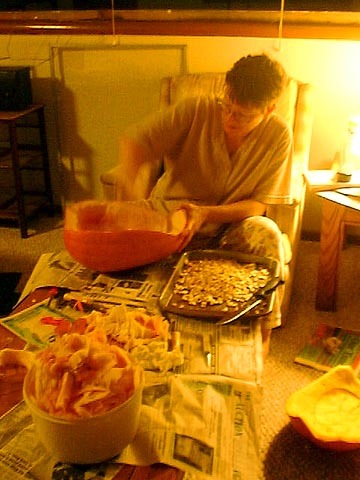 The idea of floating pumpkins came to David in a dream while camping in Brown County Indiana during Halloween in 1984. The first time he actually floated some was in 1993 down the Huron River in Ann Arbor and the second was with his wife and friends in '94. As they watched them float around the bend from the cottage, someone suggested they see if the pumpkins would make it to the Sears Bridge. 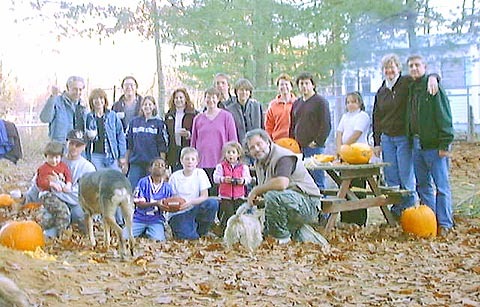 Ever since then, the Pumpkin Float on the Muskegan River has become an annual event which brings much joy to both adult and child. 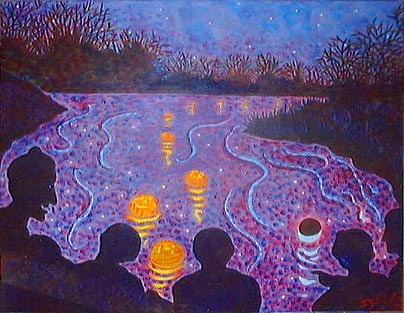 On a typical year, some twenty illuminating orange spheres bob their way down river in convoy; an astonishingly beautiful sight. No one knows how far they make it downriver from the their launch, but we've had at least one report of pumpkins being spotted near Hersey, some thirty minutes downriver by car. I think it would be really fun if other folk upstream from us would launch pumpkins the same night, so we could enjoy a continual flow of radiating pumpkins! When the last of the pumpkins have rounded the bend in the river, it's time to pile into the cars and head for Sears Bridge, where we eagerly wait for the first pumpkin to round the bend in the river. A surprising amount of pumpkins usually make it this far. 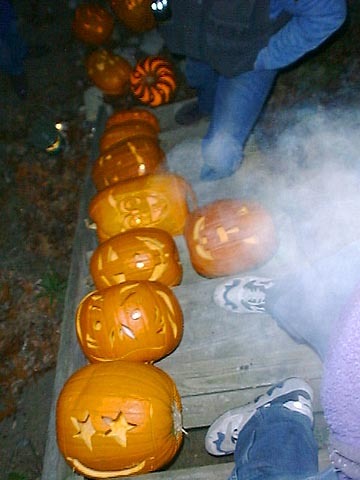 Typically, out of twenty pumpkins, you can expect more than fifteen to make it to the bridge. 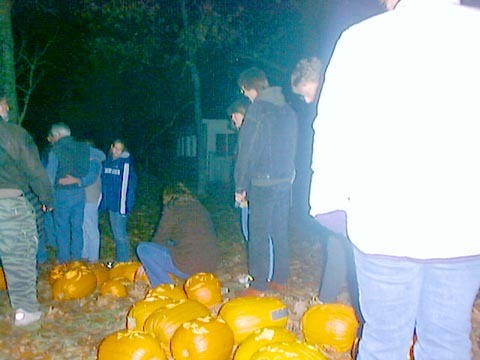 We're hoping to expand the practice by getting other riverfolk to start launching illuminated pumpkins at the same time. 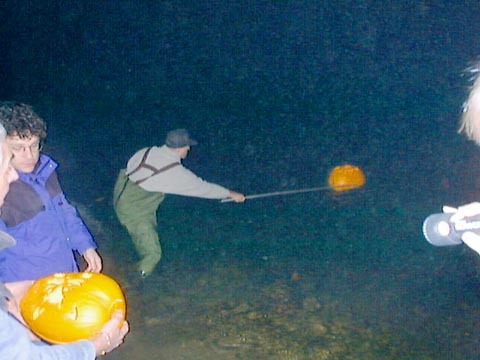 See you at the next Pumpkin Float!